Checks and shows the shortfall of materials to complete your daily crafting quests. 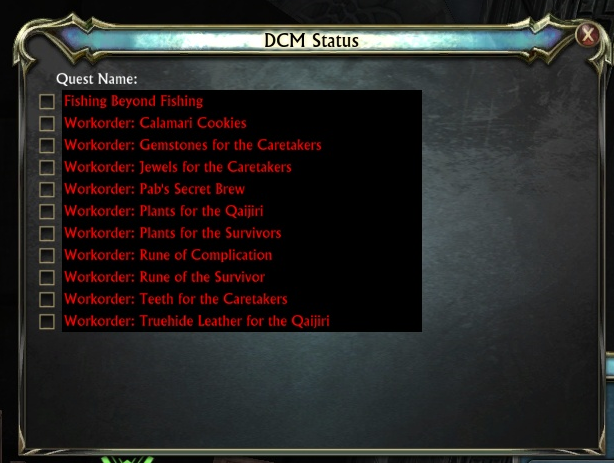 After getting annoyed at the Rift quest system telling me I had enough materials to complete all my daily crafting quests, only to have some go un-complete as I handed in other, I wrote this addon to check materials for all dailies. The left grayscale image is shown when the button is unlocked (moveable), and the right image when the button is locked. Right-clicking on the button will toggle between locked and unlocked states. Note: If you have Docker installed, then the movement and locking options are disabled, and Docker manages the positioning of the icon. Left-clicking on the button when it is locked, will open up a window showing all the quests you currently have in the 'Profession' category. Red text indicates you havent configured the quest yet. NOTE: If you have more quests than fit on screen, you can scroll the list using the mousewheel. So, click on one. This opens a configuration window. 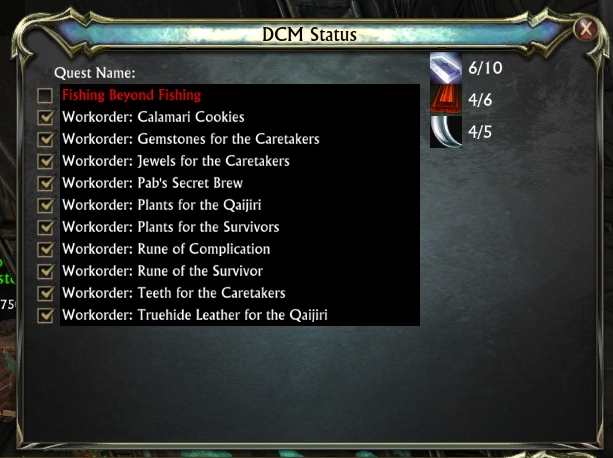 Drag all the required materials over to the 1st column of the gray boxes, and set the sliders to the quantity required to complete the quest. This will update the status window, and the quest name goes white, indicating that you have set it up. In my example, you can see that it is telling me I only have 6/10 rhenium bars required for the quest. So, finish setting up all the remaining quests. So, we can see I have 6/10 rhenium bars required, 4/6 madrosa lumber and 4/5 unerupted teeth. This is where the 2nd column of gray boxes in the configuration screen comes into play. Since I am a miner, then ore and bars are effectively the same thing - so for the purposes of having enough materials to complete the quests, I can treat them like that. So, if I open up the quest that uses rhenium bars, I can drop the ore into the 2nd column, and click apply. I can do the same for the Madrosa lumber, and have the timber being equivalent. NOTE: Once you have setup an alternative for a primary material, then it remains setup. You can break this link by RIGHT-clicking the alternative material on the configuration screen. You can untick quests to ignore their material requirements, in which case the text goes orange to make it clear. Here you can see that with that one quest unticked, I now have enough unerupted teeth. - Update to support German clients (Inspect.Quest.Detail().categoryName is translated for DE, and "Profession" for EN/FR/RU ! - Now tracks needed materials on alt characters. - Now has a DB of quests/materials - so it should autopopulate! - Added a button 'Capture' to grab items from recipe books etc. 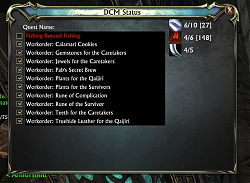 I needed 16 Karthite Bars to complete todays quests. I only had 12 Karthite Bars, however, Karthite Bars are sub-defined as needing 1 Karthite Ore. I had 2 Ore in the bank. I included two as they're different lines but the latter happens more frequently. As for the way the layout looks, I have attached a screen. As you can see, the list of mats never changes, even by disabling the quest. What does capture mean? How do I set it up to recognize the raw mats? Can you update the FAQ on this please? It's a bit confusing now. Just thought I should share it. I used it for the first time, but dropped a piece of ore into the right hand side without having anything in the left. This caused the whole inventory system to bug out: so much so that all future quests showed every requirement! I fixed it by finding the database and deleting it, and removing and reinstalling DCM. If anyone wants to take over maintenance - and adelea is okay with it - I would love to see this fixed! It seems the bugginess is not in fact to do with my mistake: it's probably some interaction between the addon and changes to the RIFT code between when the addon was last updated and now. I did a complete removal and reinstall and it's still doing it. NOTE: that's your user directory, not your program files directory. 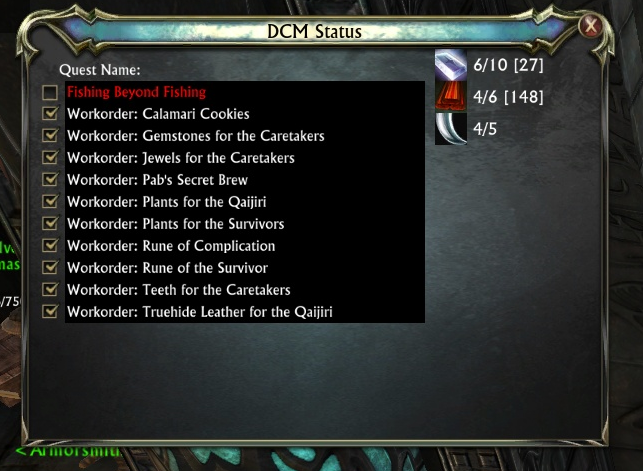 I've started playing Rift again - and have rewritten a big part of DCM. I will post the update soon! Last edited by Seshatt : 01-03-14 at 09:45 AM. I've been studying the saved files. I wonder how difficult it will be to merge people's saved files. I wish I had been using the app since I started the character to get early stuff. pro tip: Get a survival/fishing daily that you don't do which allows you to make a mat tracker for any purpose. Just put the mats you want to track into that quest. Once I don't see new ones I may perhaps upload a saved file as a "Preload addition" to the addon, and then down the line update it to include all the weeklies assuming it doesn't just take 2 weeks to get them all. All this provided of course that I can get a test of it to work and the author doesn't tell me its under further development already. I havent played Rift in weeks - lack of interest + too busy in RL. 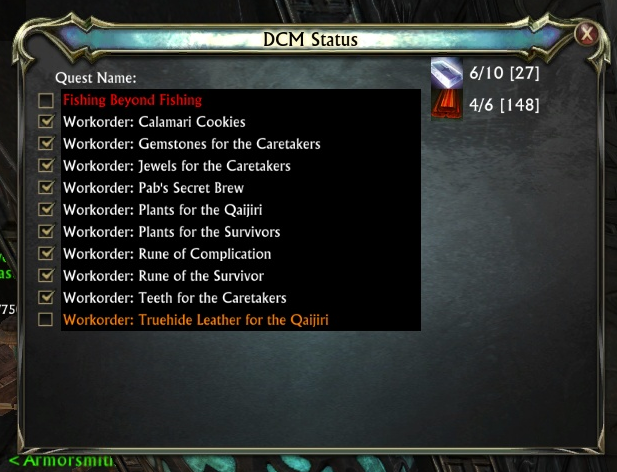 That said, adding all the known quests to a database inside the addon, and allowing people to automatically populate from known quests is quite a nice idea. Before I was using addons I was doing this with pen and paper. Totally awesome to have it done unscreen. I have all 9 Crafting skills capped at 375 and mainly focus on the dailies, so this is a must have. One tip for new users: After you go to all the trouble of setting up a group of quests, take a moment to logout. That seems to been when the data is saved. I may be mistaken, but I turned in my quests and played for 3 more hours and crashed at one point. After that the addon didn't remember which ores went with which bars anymore. I'm assuming it has forgotten the other quests at all now either. I loved the Addon that much I had to comment on it after using it for just one day. I like how it's optional to put ingredients, so you could if you want only put the stuff you would buy, and then farm the rest. Also you can choose to put the vendor purchased items or not. I of course do because I need so much of the same stuff, specially between armor and weapons, particularly Flux. Save me a few trips to the vendor too, not just the Auction House. It would be nice to some how create my own "quest" of mats I want to collect for any other reason. Since I Have all 9 skills I would love to send you my saved files that maybe could be included in a future version, to at least have the endgame quests preloaded. I don't have fishing or survival so maybe someone else could donate that. If this had all the quests preloaded, even just the end game quests, it would become even more popular that it is. Sorry if I went on and on, but I hope I made it clear this addon is freaking awesome. Undoubtedly. Edit: Addon is worthy of a clean up grammar/spelling edit of my comment. was going to add some thoughts but I will just post an additional comment. Last edited by usnea : 11-24-13 at 04:52 PM. As a maniac crafter, this is by far my favorite RIFT addon of all time. But there seem to be some recipes that don't save: Ultimate Double Bacon Cheeseburger, Sword of the Mutant Tartagon, and others (like the supply quests). I'll watch for them again tomorrow (or whatever day I do my crafting dailies next) and post here. Last edited by Stormbow : 08-14-13 at 07:32 PM. 1) For the alternate materials, is there a way to set the number of them per final required item? Ores -> Bars and such are easy, but something that takes Bolts of Cloth for an outfitter take 2 cloth to make one bolt so you'd need a 2 to 1 equivalency. 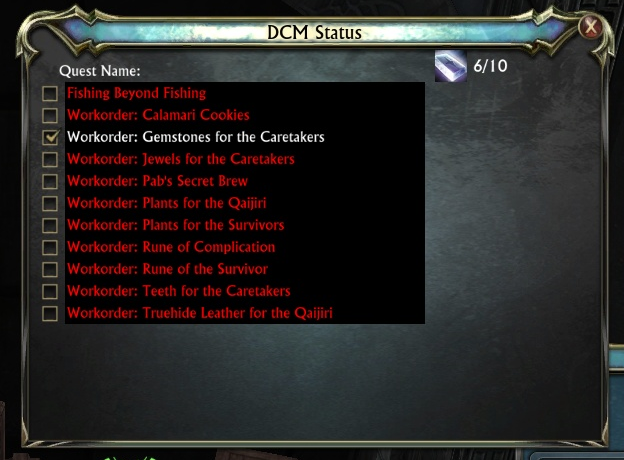 2) Since I have multiple characters doing dailies, but only one character doing the resource gathering, is there a way to see a 'master' list of how much is needed across all characters? Keep up the excellent work, its appreciated! 1. It doesnt make any decisions based on the number of alt mats you have. The alt display isnt how many of the primary you can make with the alt, its how many of the alt material you have. So, I dont think the fact that you need 2 cloth : 1 bolt really makes any difference - other than remembering you need to obtain 2x the shortfall of raw materials. 2. This idea, though, I like. So I will definately get it added in.